As an official affiliate of the GRAMMY Museum®, each year the Marcia P. Hoffman School of the Arts hosts the Music Revolution Project® focused on developing the next generation of GRAMMY winners. 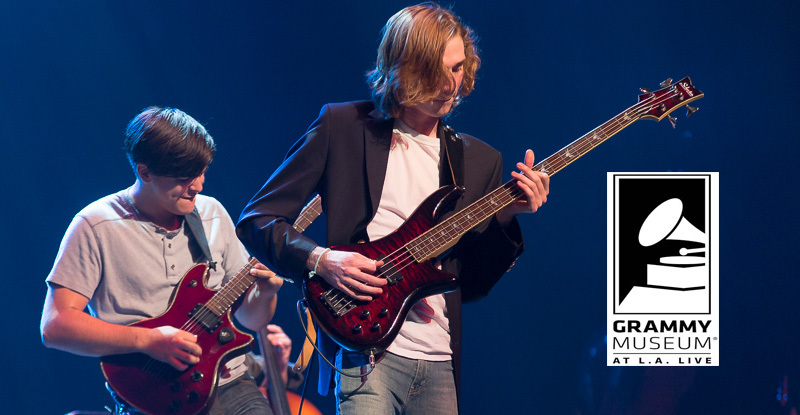 This is an intensive, four week program including instruction, performance and mentoring with award-winning artists, directors and composers culminating in a live concert on the Ruth Eckerd Hall stage. For more information about this amazing opportunity, please call 727.712.2706 for more information including program dates and the application guidelines and process. This is a FREE intensive four week program including instruction, rehearsals and mentoring with award-winning artists, directors and composers. It offers talented youth in the area the chance to engage in musical workshops, songwriting courses, mentoring sessions, record the material they’ve written and perform their new work live. Project Tampa Bay takes place from July to August (various times each day). A formal student performance will take place at the of the program on a Ruth Eckerd Hall stage for family, friends, and fans. Students must participate in all four weeks of the program. Talented high school and college students ages 14 – 21 are encouraged to apply. The Marcia P. Hoffman School of the Arts at Ruth Eckerd Hall will house the program. You will be working with professionals in the music industry. You will broaden your musical and creative skills, while establishing relationships, increasing your self-esteem, and developing entrepreneurial skills. This is a highly selective and prestigious program. Alumni of the Project will garner important connections to the music industry, colleges, and the ability to continue to work with the project in future years. Past participants include local music sensations Ella Jet, Kayla Ember, The Young Something, and The Ries Brothers, who have gone on to perform and open at events and concerts nationwide for Daughtry, Firefall and Chicago – as well as their own SOLD-OUT concerts at Ruth Eckerd Hall’s Murray Theatre. The successful programs we provide to our students would not be possible without YOU, our members! From the Marcia P. Hoffman School of the Arts and the alumni of the GRAMMY Museum's® Music Revolution Project®, thank you for your continued support. Become a member today and start making an impact for our students and organization. Bob Santelli, Founding Executive Director of the GRAMMY Museum® and creator of the GRAMMY Museum®’s Music Revolution Project® presented the Marcia P. Hoffman School of the Arts at Ruth Eckerd Hall with a plaque recognizing the school as a GRAMMY Museum® affiliate. Check out the rare experiences our students had with GRAMMY nominated artists over the years.